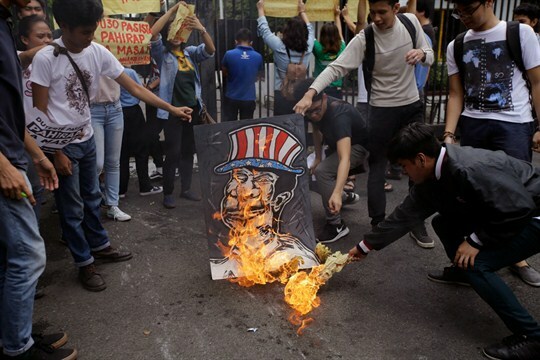 Filipino students burn a caricature depicting President Rodrigo Duterte during a protest in front of the gates of the Malacanang presidential compound, Manila, Philippines, Oct. 19, 2017 (AP photo by Aaron Favila). Philippine President Rodrigo Duterte is approaching the third calendar year of his bombastic term in office, but for all his tough-guy language, his policies on several critical issues remain muddled and contradictory. Duterte’s blunt, aggressive rhetoric—often veering into profane rants, including one last week against the European Union—has played well at home, keeping his popularity high. A September poll by Pulse Asia showed that about 75 percent of Filipinos have trust in Duterte, despite the notable gap between his talk and his actions in three key areas.